Whatever project you’re working on, the chances are high that you’ll be using the same snippets of code that you’ve used in your previous projects as well. Whether it’s a data table, a search, breadcrumbs or pagination — wouldn’t it be nice to have a library of bulletproof reusable CSS/HTML components and just grab them when you need them for your work? Pea.rs might be just the tool you’re looking for. It’s an open source WordPress theme that lets you collect, test and experiment with interface pattern pairings of CSS and HTML. You can easily have your own pattern library setup and running quickly. Essentially, each pattern is a post in WordPress, code snippets are added using custom fields, and the main content field is used for optional notes. Very useful! 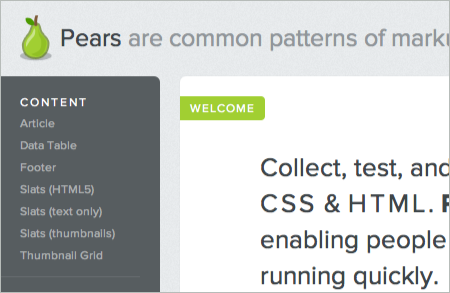 Here is a sample theme options page that you can use for creating your own theme options.